"So our only request is that in whatever condition you may be, please try to chant these sixteen words whenever you have time. And you have time: you can chant Hare Krsna when you are walking on the street, when you are traveling on the bus, or when you are sitting alone. There is no loss, but the gain is is very great. Therefore our only request is that you take up the chanting of this maha-mantra -- Hare Krsna, Hare Krsna, Krsna Krsna, Hare Hare/ Hare Rama, Hare Rama, Rama Rama, Hare Hare. And we shall periodically remind you by the functions such the one we are holding today, the Rathayatra festival. This Rathayatra festival is very old -- at least five thousand years old. Lord Krsna, along with His elder brother, Balarama, and His sister, Subhadra, once rode in a chariot from Dvaraka to Kuruksetra, and this festival commemorates Krsna's riding with His family on the chariot. 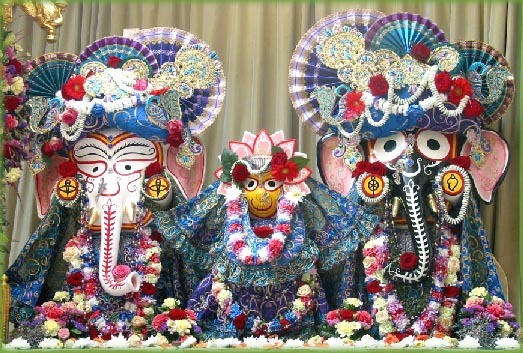 This function is held every year in Jagannatha Puri, in India, where it is a great celebration."